Has the Internet ushered in a revolution in advertising, or is web advertising destined to fail? 1. Advertising has multidimensional sectors. Two of the fundamental axes in advertising are the lines between brand and direct response marketing, and between online and offline ads. I can’t do the differences justice here, but essentially brand marketing is intended to make you feel a certain way about a product, while direct response is intended to make you take an immediate action regarding a product. The concepts seem simple, but whenever new media arises, it can be quite tricky to determine what kind of advertising is suited to the media. When the Web first burst into mass acceptance, some advertisers treated this new medium as a branding opportunity, plastering their logos and flashy campaigns wherever they could. Google was among the first to realize that direct response principles fit the Web much better than branding – deliver ads against search results and you have a natural audience to act upon that hyperlink. But the Web continues to evolve, giving continued opportunities to make the wrong choices about ads. When social networks like Facebook reached mass popularity, many advertisers tried to deliver targeted direct response advertising to demographics discovered through the social graph. But “banner blindness” and the very social intent of these sites combined to make pure direct response ads ineffective. The better strategy for advertisers in social networks is to build a community and create engaging viral media to enhance the brand. So the lesson here is that advertisers have to make very savvy choices between brand and direct response advertising as the evolution from offline to online continues. 2. 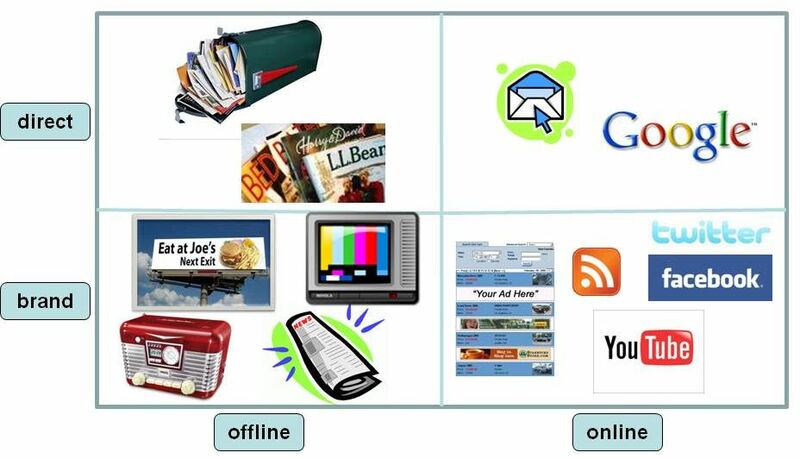 Online and offline ad spending patterns are currently inverted. In the excitement about the growth of online advertising, it’s easy to forget that offline is still much bigger, with online making up roughly $23 billion of a $137 billion U.S. ad market. These numbers are even more interesting when examined along the divide between brand and direct response. According to one estimate, around 75% of offline ad dollars are spent in brand marketing, while 80% of online ad dollars are spent in direct response. 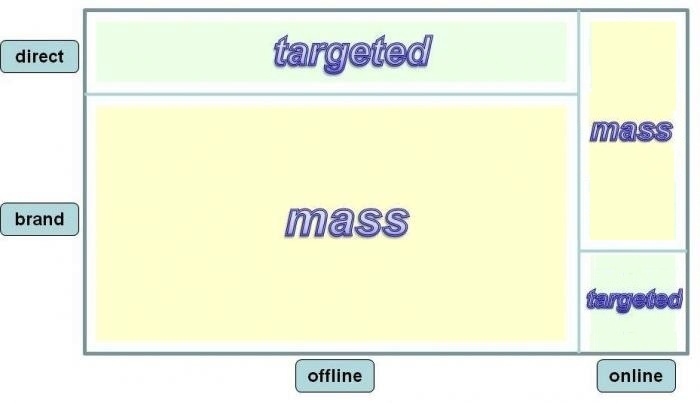 Because offline is so much bigger than online, that means that direct response offline (a.k.a. “junk mail”), makes up around $28 billion. Yep, junk mail is bigger than the entire Internet ad industry. Now here’s a point that’s a little more abstruse, but I hope it’s worth the time to understand it: the advertiser’s spending pattern is inverted in online vs offline. Offline brand advertising is expensive to create, but reaches a mass audience, so the spend per viewer is low. Take a Super Bowl ad: a 30-second commercial can cost $4 million (for air time and a lavish production cost), but with 95 million viewers, that’s only 4 cents per viewer. Let’s call this low cost per viewer a mass spending pattern. Offline direct response advertising total cost is lower, but higher per person reached. For example, it can cost $50K to produce and mail a catalog to 10K recipients. At $5 per person, that’s 125 times more expensive per person than a Super Bowl ad! But it works because of the targeting – those 10K people have been identified by the advertiser as being likely to be interested in the product. This low threshold, high cost per viewer is a targeted spending pattern. The patterns are rewired online. Search advertising and email campaigns are direct response in that there is a clear desired action (usually a click). Though the cost of the keyword or email campaign can be relatively low, the distribution is very broad, so the cost per viewer is extremely low – this is a mass spending pattern. Conversely, doing effective brand advertising on a social network requires really identifying the target demographic and crafting a creative campaign to get that ballyhooed viral explosion. That means relatively high creation cost and a specific audience, resulting in a high cost per viewer – this is targeted spending. So offline, brand advertising is mass spending while direct response is targeted spending. And online, brand advertising is targeted spending while direct response is mass spending. Or at least, that’s the way it is today . . .
3. Successful advertising tactics will seek equilibrium. Pundits are always rushing to declare failure, or any new method the death of all old ones. But offline advertising feeds online, and online direct response may morph into “brand response.” Advertising, like nature, restlessly searches for equilibrium. The story above is heading towards a more stable balance so the value of the spending better matches the returns. It’s not controversial to suggest that offline ad dollars will move online – that’s more an observation than a suggestion at this point. And it’s also been an observable trend that offline direct response marketing is declining at an even faster rate than offline brand marketing, because Internet direct response has rapidly become effective for larger audiences. But I’m adding two conjectures that aren’t easily observable today. First, online brand marketing will grow at a faster rate than online direct response. This means that social media like Facebook and Twitter (like them, not necessarily those two) will grow revenues faster than Google. 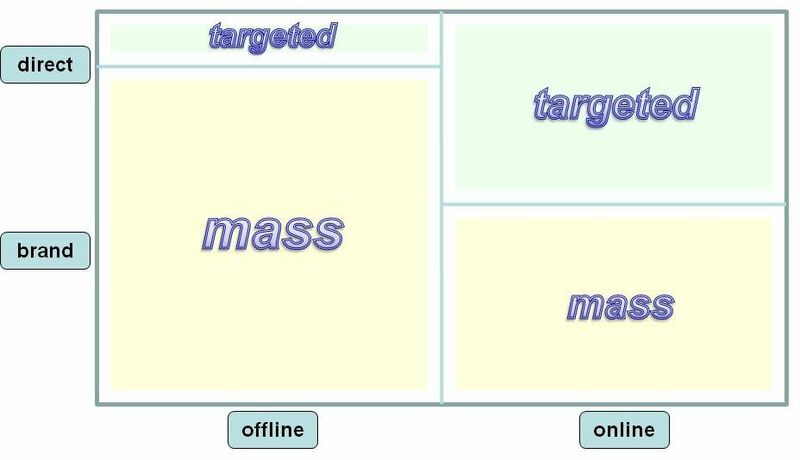 Second, online brand spending will revert back to the offline spending pattern of mass rather than targeted, and online direct response will similarly go to targeted spending rather than mass. I believe that dominant social media sites and practices will arise that allow brand advertisers to reach a large audience at a low cost per viewer. At the same time, increasingly effective data collection on Internet consumers will allow data holders to sell highly targeted direct response ads at premium prices per consumer. That is a lot of money sloshing around, in a lot of different directions. I think it’ll happen within 5 years.